Here is what the cake looks like! Here is how to make the Midweek treat! 1. Sift the cake flour together with the baking powder twice to airate the flour. 4. In another bowl, beat the egg yolk with the remainder 1/4 cup of sugar until the sugar dissolve. 5. Add milk and vegetable oil into the egg yolk mixture and stir to mix well. 7. Gently fold in 1/3 of the egg yolk flour mixture into the egg white until blend. Repeat with the remainder of the egg yolk in 1/3 portions. 3. Beat the whipping cream and the icing sugar together until thicken. 4. Cut the circular cake into three layers. 5. Spread the whipping cream on the surface of the bottom layer and top with strawberries ices (or your desired fruit). Spread whipping cream on a second layer and place it on top of the first layer. 6. Top the second layer with slices of your desired fruit. Spread whipping cream on the last layer and place it on top of the second layer. Spread whipping cream on the sides of the cake. 7. 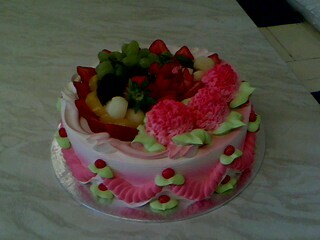 Decorate the top of the cake with more nicely cut slices of fruit. Place the cake in the refrigerator for at least half and hour before serving. Open for question & answer: How are Bloggers Changing Fashion?